Fit the desired door knob, external door handles, door address numbers, etc. 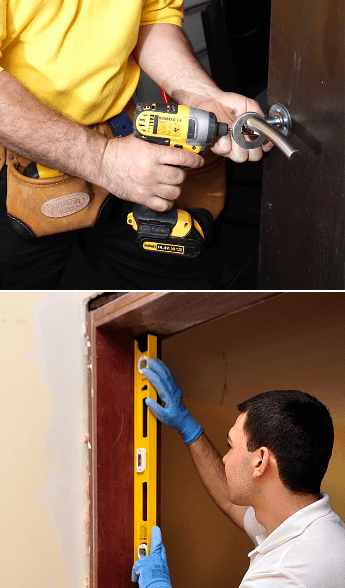 Why should you choose Fantastic Handyman for your door lock installation? The team will burglar-proof your home by providing you with instant door handle latch or front door knob repair. But if you host a classy event instead and want your door to look the part, the pros can also spruce up your entrance with fancy door handles interior or custom-built residential mailboxes. Even a job as simple as fitting an internal door handle or a peephole will require its fair share of materials. Luckily, your specialist can shop for all nuts and bolts for you and provide them on the spot. To ensure that you are getting your money’s worth, we will list all purchased components in your final price quotation and their associated costs. It's very easy to install a door handle, but it's quite tricky to keep it from jamming after a few weeks of use. The trusty London team has successfully modified many front entrances in the past and fitting kitchen door handles, residential mailboxes, or wide angle peepholes has almost become like second nature to them. Unlike many other competing companies on the market, we will not charge you an additional fee on top if you've decided to suddenly cancel your session for door handle fitting in London. Just make sure to contact our cordial customer support 48 hours before the team's arrival and leave the rest to us!